Could This Market Rally Be a Head-Fake? Charles Hugh Smith* questions the current market rally - questions if there is nothing supporting this rally other than euphoric sentiment arising from orchestrated buying, any eruption of reality will reveal the rally as a head-fake .. "This entire rally has an engineered feel. All the technical 'buy' signals are precisely what you'd expect in a rigged rally .. The rally's strength is reminiscent of the 1999-2000 Internet-era stock market, but compare the fundamental backdrop of then and now. Back then, earnings, sales, profits and employment were all up strongly globally, and China and the emerging markets were experiencing trade-based organic (i.e. not the result of central bank stimulus) expansion. Can the same be said of the present? No. Employment is stagnant once low-paying part-time jobs are stripped out of official cheerleading statistics, and corporate profits are sliding--especially if' 'one-time charges' and other accounting trickery are stripped out. As for global trade--it's stagnant or down. 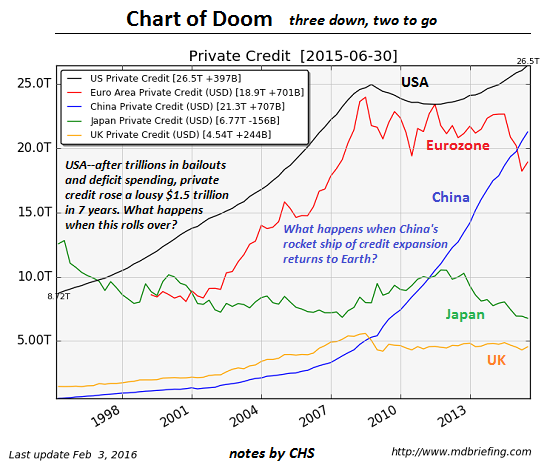 Whatever 'growth' is officially reported is either suspect or based on unsustainable expansion of private credit or central bank/state stimulus."